The time comes in every frozen fish’s afterlife when it must leave the security of the deep freeze to be thawed, prepped and cooked. The second large piece of Coho in our freezer met its fate this week – a fate that including a roasting, a baking and finally, a chowdering (is that a word?). Jason scaled and washed the salmon and stuffed it with fresh tarragon and lemon slices then roasted it in a 450 degree oven atop roasting fennel bulb and leeks and a dash of white wine. Roasting it bone-in with the skin on protects the meat from over-cooking. 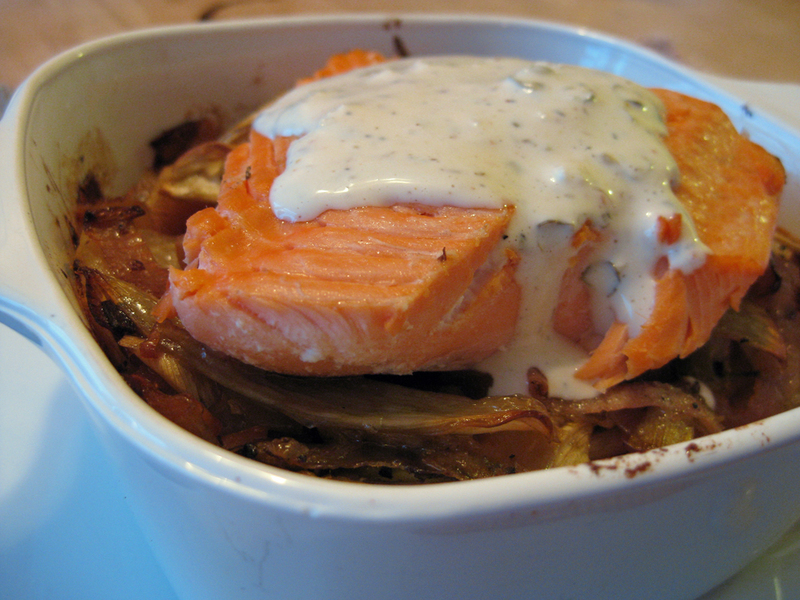 Still, salmon, like all fish, shouldn’t cook too long and get too hot or the flake of the fish becomes brittle and dry. The resulting roast of salmon couldn’t have been tastier. We plated it with the roasted vegetables and a heap of horseradish mashed potatoes. We wanted more the following day and since everything was cooked, all we had to do was load up a couple of baking dishes with mashed potatoes, a bit of veggies and a piece of salmon. We popped them into the toaster oven and within minutes we had a composed one dish meal. Because the salmon was dry thanks to the second cooking, it got a nice dollop of lemony mayo sauce that included chopped capers, fresh lemon juice, a dash of Tabasco and a little salt and fresh ground black pepper. 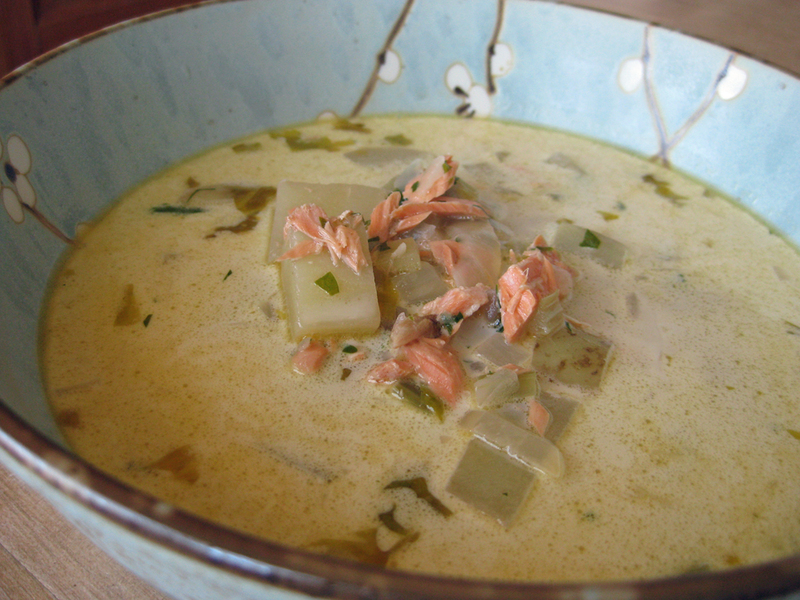 Later in the week, the leftover salmon enjoyed a second “life” in the form of a delicious chowder of sweet pink flakes in a light cream broth with potatoes, leeks and fresh herbs. I enjoyed a big bowl for lunch, then a second! The batch must have been huge because there’s plenty left for another day and Jason froze a mess of it for a future quick meal. Cooking the salmon leaves plenty of room in the deep freeze for more fish. We’re hoping for a good catch next month when we try our hands at deep-sea fishing just off the coast of San Francisco. We’ll be sure to share the experience here so please stay tuned. Preheat the oven to 450 degrees. Add a couple tablespoon olive oil to a small roasting pan. Add the fennel, leeks, and salt and pepper to the pan and roast for 15 minutes. While vegetables are roasting, scale and clean the salmon. Salt and pepper the cavity of the salmon then stuff with tarragon and lemon slices. Coat the fish with olive oil and add more salt and pepper. Add the white wine to the roasting vegetables, then place the salmon on top of the vegetables and roast for 15-20 minutes. Check to make sure the salmon does not over cook. Serve with mashed or roasted potatoes, and aioli, tartar sauce, or hollandaise sauce. If you’re using salmon steaks cook them for 10 minutes, or so, depending on the thickness of them. Check often to make sure the fish does not dry out. Heat stock pot over medium heat and add butter. When butter is melted, add onions and sauté until tender and translucent, about 5 minutes. Add celery and garlic, cook for 3-5 minutes longer being careful not to brown the vegetables. Add broth and potatoes and cook for approximately 10 minutes or until the potatoes are just tender. Add salmon, cream and milk and heat until hot but not boiling. Add chopped parsley and serve. Note: if you prefer a thicker chowder, add 2 tbsp flour to onion, celery and garlic after the sauté and cook for a few minutes before adding stock. Be careful you don’t allow the roux to brown. Whisk liquid into the pan to prevent small “dumplings” from forming. Proceed with the remaining recipe instructions. Secret ingredient to my Chowder is cinnamon it deepens the flavor. Try it once and you will never go without. nice post guys, sounds delicious! Zannah – That’s a fantastic tip and one we’re sure to try on the next batch! Thank you for sharing it with us.